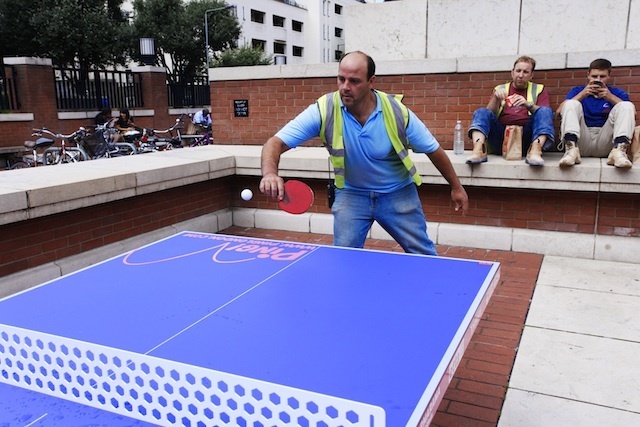 The government's drive to boost sports participation might not have wholly succeeded, but one Olympic game is set to take over the streets, shopping centres and squares of London this summer: ping pong. A hundred tables will be installed across the capital from tomorrow (29 June), all of which are free to play and come with bats and balls. The returning Ping! initiative is backed with Lottery money and comes from the Sing London organisation, which also brought London a platoon of playable pianos. The scheme launches tomorrow at Broadgate tomorrow (12-2pm) with a whiff whaff masterclass and tournament. Other announced table locations include Leicester Square, Heathrow Airport, the Roundhouse and the British Library. Others are mapped here. Go on, indulge in a spot of lunchtime wrist action.